(Photo Courtesy/Mike Beiermeister) NEMIGLIS Network Coordinator Meag Schwartz talks about some of the macroinvertebrates that inhabit Sytek Park. Alpena — Fifth-graders from Ella White Elementary had a busy afternoon over at Arthur E. Sytek Park in Alpena on Tuesday morning. The children adopted the park to help make enhancements and learn about the nature that inhabits this ecosystem. Students wrote in nature journals about what they saw, examined the different animals and plants, collected trash, and took water samples to be analyzed. 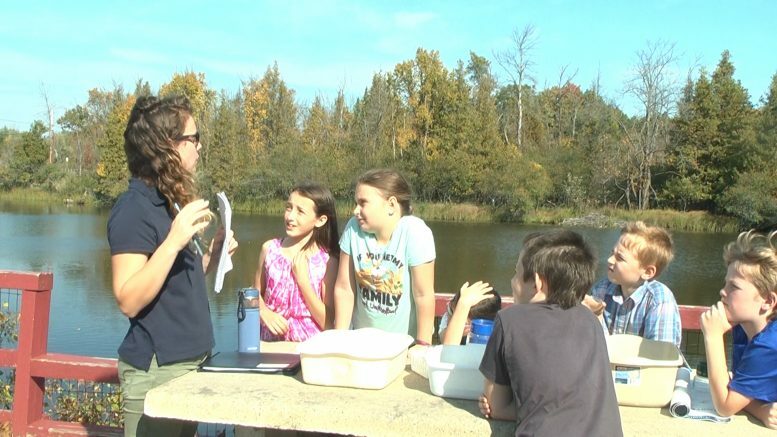 The project created in partnership with the Northeast Michigan Great Lakes Stewarship Intiative (NEMIGLIS) and Huron Pines AmeriCorps helps the kids become better environmental stewards in the area. It teaches them to be aware of their surroundings and conscious about issues facing the environment. “The fact that I get to go into nature and, I’m never really out in nature a lot,” said Student Tanner Male-King. The students will go over their observations to find out small projects in order to help enhance Sytek Park. They have some ideas already in mind, including repair of a broken dock. They have also identified other issues where action needs to take place. “There is all of these fishing lines from people just throwing them on the ground because there is no trash cans on the trail and, we just need to fix that,” said Student Gavin Phillips.